A 9 payline ‘video’ slot with a circus theme, this Big Top mobile slot is for novices who want to move up their game from classic 3 reel slots to more complicated 5 reelers. Let’s start with the theme. It’s cute, it’s bubbly, it’s simple. Roll up, roll up! Watch the tiger ringmaster as he opens up the show with wild colourful clowns, scatter monkeys, leaping seals and elephants on bicycles! It’s the show of a century! Well actually it isn’t. This is an incredibly simple 9 paylines video slot from Microgaming, which may have been video online, but almost certainly isn’t on the mobile version. Now don’t take us wrong, you might think that we are taking this as a criticism, but we are not. Because actually, due to it’s simplicity, we found that this Big Top slot machine played very well on mobile devices, and the brilliancy of the graphics particularly suited the HD screen of our tablets. Where it does disappoint is the betting range – you have to bet the whole 9 lines, and at £/€/$2.25 minimum bet, many novices still trying to learn to budget their play money might find this a difficult sum to manage. High bidders and more experienced players will probably revert back to classic slots for a simpler cleaner mobile game or more interesting video slots with far more intricate (ie. any) features. So we are left unsure to whom Big Top mobile slot is aimed for, but if it’s your favourite let us know why as we’d be interested in hearing a second opinion. Scatter: The monkey with the tiny party hat is the scatter symbol, with any wins multiplied by the total number of credits staked. No bonus games or free spins. With a betting range that is either too high to appeal to the real novice slot player and not high enough for the big better, this simple mobile casino game has a serious identity crisis. 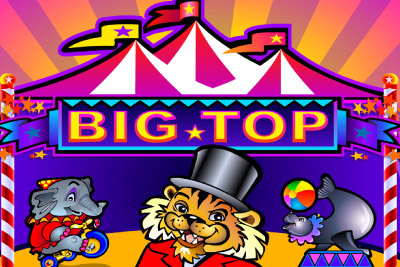 Which is a shame, as Big Top mobile slot looks and plays wonderfully on tablets and mobile, largely due to the simplicity of the game and the bright colourful theme. Still one we could see ourselves getting attracted to when we want a fool proof video slot that doesn't require much thinking and we catch ourselves being tempted by the 5,000 coin jackpot.